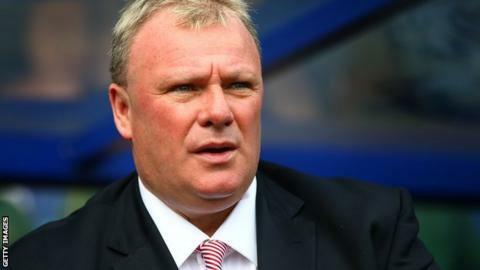 Former Rotherham United boss Steve Evans says it was an emotional moment when he agreed to leave after three years in charge. The 52-year-old parted company with the Millers on Monday, along with assistant manager Paul Raynor. Evans led Rotherham to the Championship but they have struggled this season, having lost five of their nine matches. "There were differences of opinions as to where the club was going," Evans told BBC Radio Sheffield. "Steve Evans had to make a decision for Steve Evans, and chairman Tony Stewart had to make a decision for himself and his football club. "At the end of the meeting we hugged and there were some tears. It was a very emotional moment, for someone to watch his chairman shed tears and know that in the next few hours we were going to formally part." The Millers finished one place above the relegation zone last season and have struggled to make an impact this term, with just eight points from nine games. Evans' final match in charge, a 2-0 win over Birmingham City, saw the Millers move off the bottom of the Championship table. "The brief from Tony Stewart when I joined the club was to do what no other manager had done and take them to League One," Evans added. "We took them (further) to the Championship, we stayed up and it's been nothing short of a huge success. It won't be a secret to many people that my phone has been quite lively since yesterday."